Just the other day...I had one of those moments, the kind meant to be treasured. There was hardly anyone else on the beach. It was late in the afternoon and a bit overcast. The sound of the waves had washed away any amount of stress I had brought on vacation with me just days before. 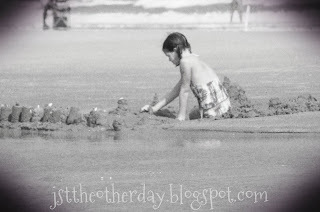 I sat on my knees, digging in the sand, trying to remember the last time I had felt so free to just "be". My eight year old daughter happened to be my playmate. I listened carefully to her instructions on the flow of the water and the proper direction I needed to push the sand. Our castle was begging for a moat, so my little engineer figured out the best way to build it. As we worked together, I marveled at her intelligence and beauty. This time with her, this moment, was a gift. She recognized it, too. At one point she broke from our conversation and work and said, "Mommy, I don't feel like you're my mommy right now. I feel like you're my best friend." "Me too, honey. I feel the same way," I said, looking deep in her eyes as we exchanged smiles. I wanted to pinch myself, thinking..."Is this real? How is it that I came to be so blessed?" Her statement made me think about another day that I sat playing with her. She was just a baby, probably only six months old. My husband, who was watching us, suddenly remarked, "You're raising your own best friend, you know." How profound his words were and are. Yes, I discipline her. Yes, I teach her. Yes, I guide her. Yes, I mother her. But after all of "that" is said and done...when she flies from the nest one day and the main bulk of my work is over...what I hope to be left with is a best friend. The fact is, there is a special woman in my life who once played with me in the sand. She kissed my boo-boo's, took me shopping, and showed me special attention after some mean boy broke my heart. She was there, waiting on me after every practice, every football game, and every outing with friends. She showed me the heart of God and taught me how to listen...really listen...to Him. She is my best friend, and I also happen to call her mom. She didn't do all that she did to "raise a best friend" and neither do I and neither do you, but the effect of it all...all the loving and pouring out that we do...it ends up molding this mystery of a relationship. Who can explain it, exactly, the bond between mother and daughter? It is something timeless, eternally beautiful, awe-inspiring, and pure. One day in the future, when I'm very old and my daughter is still considered young, it's my prayer that she'll once again be able to say a version of the words she spoke to me on the beach that day. I hope to hear something like, "You're not only my mom. You're my best friend." I'll look back at her and remember the girl who once stood before me. I'll swell with pride at the woman she has become. I'll swallow hard, dare myself not to cry, and say to her with a smile, "Me too, honey. I feel the same way."